Working from home has one major perk—I very rarely need to dress up anymore. For the past 15 years, I’ve worked in a corporate setting, so I needed to have a lot of ‘work clothes’. My work uniform the last few years, was a blazer and cropped skinny pants, paired with heels. Although I don’t mind dressing up for work, I have to admit I love that I get to rock casual clothes most days. However, I’m getting pretty bored with my t-shirts, jeans and jackets that I normally wear (something like this). Lately, I’ve been adding new types of pants, like these paperbag pants. The newest addition is adding these modern joggers. I wanted to share with you all the best joggers for women and how I’m stying these new joggers I got. I recently found these on major sale! I’m obsessed with these joggers because they are super comfortable, but also stylish. I love the seaming down the front of the leg, the detailed tie waist and, and especially the buttons on the outside of both legs. I chose to pair them with a cropped white t, a vegan suede jacket, and slip on sneakers. This is a look I would wear during the week when I’m running errands with my kids, or on the weekends when I’m running around town. This is definitely casual chic. It’s ultra comfortable, but doesn’t look sloppy. The thing about jogging pants – they CAN get sloppy really quickly. The way to avoid looking frumpy in joggers is to make sure they are the right fit. They should be cut close enough to your body that they don’t bag out too much. You also should wear a fitted top, tuck in your t, or tie a little knot to make it fitted. You can wear nearly any type of shoes, from sneakers to flats to booties or heels. Just don’t wear flip flops! That makes it way too casual. Joggers are comfy, but I still want to keep it elevated. Besides the clothing, I also added in some gold jewelry for a little shine and to dress it up a little bit. 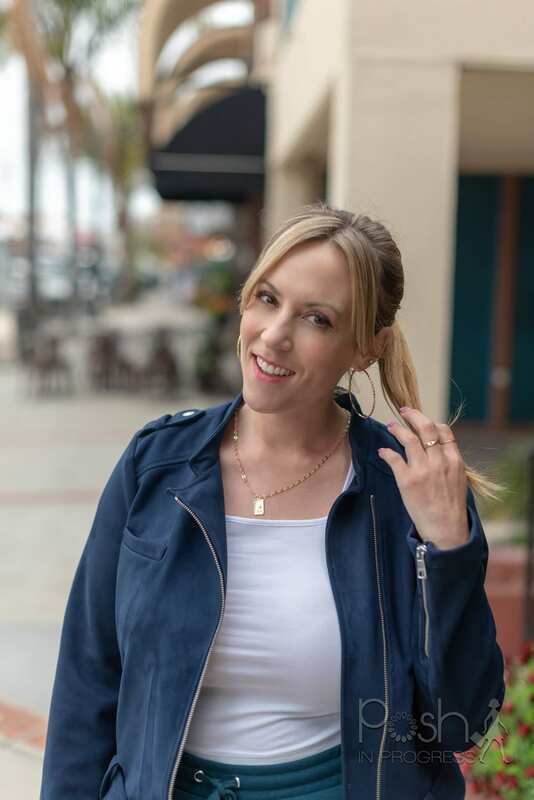 I chose to wear a pony tail to keep it casual, but if you want to make it a little dressier, you can wear your hair down and throw on nicer shoes – that will instantly transform this outfit from casual to slightly dressier. If you’d like to try out some joggers, here are some of the best joggers for women out there right now. I hope this post helps you to see that you can be both comfortable and chic all at the same time. Style doesn’t have to mean being uncomfortable.